Books – What Me Pa..Panic? My First Book is Really Done! I turned in my last chapter in early June, but it didn’t seem real. I finished reviewing the proof pages at the end of July, but I still wasn’t convinced. But when I got home from teaching this week and found a copy of my new book had been delivered by the publisher it finally sank in. I’ve contributed chapters to books for a number of years now and I’ve always wanted to have at least one with my name on the cover. I’ve started on books of my own at least twice before, but circumstances always interfered and I wasn’t able to finish them. This year I promised myself would be different and I’m happy to say it is. 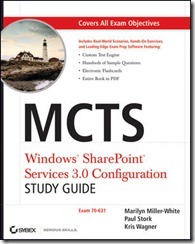 I spend the first 6 months of the year co-writing a study guide for the Windows SharePoint Services 3.0 MCTS exam (70-631). The book will be on store shelves October 19, 2009, just in time for the SharePoint Conference in Vegas. You can also order it direct from Amazon. If you haven’t certified on WSS yet, pick up a copy of the book and bring it with you to Vegas. You can find me in the Mindsharp booth in the vendor area. I’ll be PROUD to sign your book.